North Myrtle Beach offers miles of unspoiled beaches, beautiful scenery, great nightlife and some of the best fishing you could ask for. If you’re visiting North Myrtle Beach for the first time, you may be interested in taking a beach day off to go fishing! Lucky for you, there’s plenty of fishing options: charter, shore and pier fishing. North Myrtle Beach boasts three popular piers where you can enjoy the best in inshore, offshore, artificial reef, deep sea and surf fishing. Fish are abundant in South Carolina. Even young, first-time fishers will enjoy the thrill of the catch. This pier has been in operation since the 1950s and is owned by the Prince family. It became famous when a 1780-lb tiger shark was caught there. 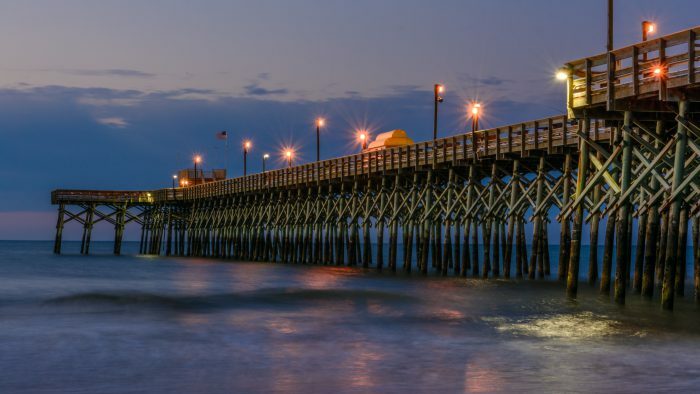 The Cherry Grove Pier is a North Myrtle Beach landmark. It extends 985 feet over the Atlantic Ocean, offering breathtaking scenery along with some of the best fishing in the state. You don’t need a fishing license as the licensing fee is included in your pier admission. Fishing season runs from February 1 to December 1. The pier is open from 6:00 am to midnight Sunday through Thursday and from 6:00 a.m. to 2:00 a.m. on Friday and Saturday. You can rent rods and buy crab nets. A daily pier pass is $3.00 and the fishing fee is $7.50 per rod. Everyone on the pier must have a pass, even if they are not fishing. 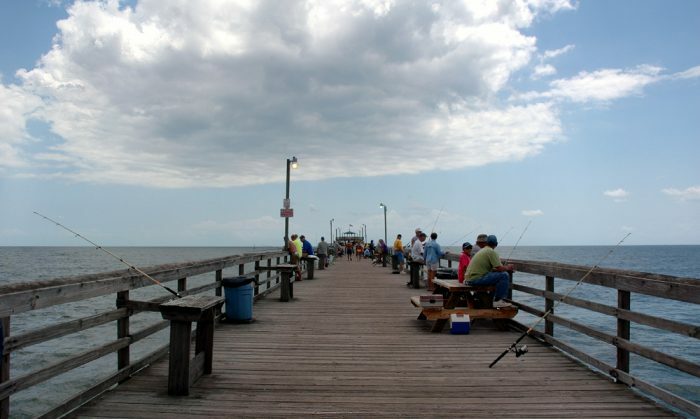 The Cherry Grove Pier features a shop where you can buy or rent fishing equipment including rigs, tackle, bait and hooks. You’ll also find a huge selection of gifts and mementoes such as books, paintings, stuffed toys, home décor, sunglasses, tee shirts, jewelry and more. Don’t forget to stock up on beach necessities like snacks, ice cream, cold beer and soft drinks. It’s all available at the newly remodeled tackle and gift shop. The longest wooden pier on the East Coast, Apache Pier offers a scenic tour of the coastline along with a wealth of fishing outfitters. The Apache Pier is in Myrtle Beach but offers another option for fishing if they’re not biting at the Cherry Grove Pier. South Carolina has 45 artificial fishing reefs. The Jim Caudle is the most popular one in North Myrtle Beach. You’ll need to head out on your own boat or with a charter captain to go to the reef system. Most of the artificial fishing reefs near North Myrtle Beach are within 5-10 miles of shore. Piers and reefs are teeming with marine life, which brings fish and crustaceans to feed there day and night. Some anglers recommend fishing at dawn and dusk, when changing water temperatures and light levels make fish more active. Use live bait and make sure it is fresh. Use a weight if you’re catching bottom feeders. Try to keep the fishing area quiet. Make sure your line is in good shape as some of these fish will put up a fight. Note that there are currently limits on how many flounder you can catch as well as restrictions on certain fish types. Some of these fish are under state protection while others, including marine mammals and sea turtles, are also under the protection of federal laws. For a comprehensive explanation of South Carolina fishing regulations and restrictions, visit the South Carolina Department of Natural Resources website. The best way to enjoy fishing in North Myrtle Beach is with a charter company that can arrange permits, take care of all the equipment details and allow you to concentrate on fishing and having fun. With a professional charter service, you can design your own day on the water. Choose from eco-tours, dolphin watching, deep sea fishing and inshore fishing. There are many good, local charter companies to choose from. Here are two that we recommend. Reel Action Fishing Charters offers small, private charters. With a limit of six adults per charter, you get personalized service and more fishing time. Reel Action arranges fishing trips, eco-tours and any type of specialized tour you request. Reel Action’s boat captains are full-time employees of the company and are trained in teaching the joys of fishing to people of all ages. They take pride in providing personalized service that makes fishing fun for everyone. Action Reel’s pricing includes all the equipment you will need for a full day of fishing. Charters fill up quickly, so call ahead or book online. Another company that offers small, private charters, North Myrtle Beach Fishing Charters lets you design your fishing excursion. You can choose backwater “light tackle” fishing, family-friendly inshore fishing, high-intensity offshore and gulfstream fishing, or deep sea fishing. North Myrtle Beach Fishing Charters also provides boating and fishing classes to people who have some experience but want to take their knowledge to the next level. Their fishing courses will teach you to catch more fish with your own equipment. The boating course teaches boat maintenance, docking and boater safety. Check their website for information on these courses. A Great Vacation Includes Fishing in North Myrtle Beach! North Myrtle Beach is the perfect destination if you’re looking for beautiful beachfronts, warm hospitality and great fishing. Contact us if you’d like more information about our vacation rentals or any other activities that will make your stay in North Myrtle Beach everything you’ve dreamed of.